"All humans beings are commingled out of good and evil." Robert Louis Stevenson's The Strange Case of Dr. Jekyll and Mr. Hyde tells the classic story of the dual nature of man. This game of strategy, based on the famous novel, allows players to score points by making melds corresponding to the current state of the main character's split personality. the first player to score 100 or more points wins. 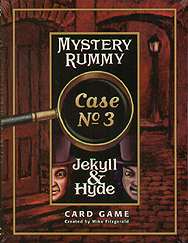 The ultimate game-winning challenge is to 'become' Dr. Jekyll or Mr. Hyde.